VENICE RESTAURANT is honored to have received a TripAdvisor® Certificate of Excellence for 2017. 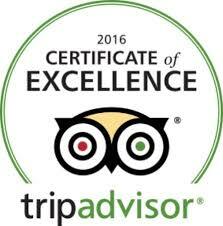 Every year TripAdvisor issues its Certificate of Excellence to businesses that consistently receive outstanding reviews on its website. VENICE RESTAURANT was again this year for the fifth time honoured to receive it. Only 10 restaurants in West of Ireland receive this coveted award. What’s more, it was the Fifth year in succession that Venice Restaurant won the award – the only Italian Restaurant in West of Ireland and Worthing to do so. The achievement celebrates Italian Restaurant businesses that have earned great traveler reviews on TripAdvisor over the past year. Certificate of Excellence recipients include quality of food, service and more.